If you're following our Sophie from Shinola saga or are just joining us, the beginning of the story and an explanation of WTF we're doing is here. And Eric has now posted Part 20. You guys are all big fans of words and language, so today were going to discuss animal group names. Some are obvious. Some are a little weird. And some are downright baffling. What could be more apt than a Pride of Lions. Or an Intrusion of Cockroaches. An Ostentation of Peafowl makes sense. A Prickle of Porcupines works fine. A Murder of Crows, a Convocation of Eagles, a Charm of Finches, a Scold of Jays, and an Unkindness of Ravens all create the appropriate mental picture. And surely, more than one Skunk is a Surfeit. Clams and Oysters congregate in Beds. Fish come in Schools, which some claim is a bastardization of Shoals, and therefore improper. A group of Sharks is a Shiver. Then there's some odd ones. How about a Smack of Jellyfish? Or a Hover of Trout? Why are a bunch of Flies a Business? A Knot of Toads; a Bale of Frogs? A Fall of Woodcocks or a Building of Rooks? A Parliament of Owls is fitting, I guess, but still seems like a reach. What did the poor Lapwings do to be grouped in a Deceit? And where the hell did they get the Cete of Badgers. 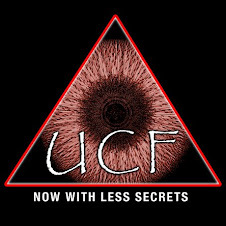 Since I'm a firm believer in taking charge of one's own destiny, I now pronounce that whenever two or more UCFers (yes, that's now the proper plural), they will be called a Cacophony. Denizens of the PAL shall be a Gaggle (although I'm open to changing that one if you've got a better idea. I'm not going to fix it here, but I've noticed that I have a bad habit of opening parentheses without closing them. I'll try to do better in the future. I like the "cacophony," but the "gaggle" just reminds me of geese. And that's no good. This close parenthese is provided by your neighborhood obsessive complusive. I agree with Janiece, and second the Swarm collective for PALs. I'm sure they (whomever they end up being) will be appreciative of not being a Gaggle! Hey, you're the one who mentioned our love of words! How about a Giggle of PALs? Actually, I kind of like Yak, but let's see what other suggestions come in. Michelle, thanks for the assist. Tom, I think you're absolutely right. If you could gather a bunch of happy Sundays together would they still be a Month of Sundays? Well Steve, Sundays not being living things, they were not the subject of today's research so I'm going to have to just hazard a guess here. First, let's accept that most months have 4 or 5 Sundays in them. So I'd guess on average, only 3 of those Sundays qualify as truly happy. Can 3 be a bunch? I think not. I'm gonna say that a bunch of happy Sundays is more like 2 months of Sundays. 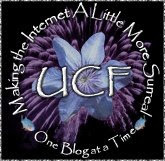 Though I'm not sure if I arrived in time to be a UCFer or will be consigned to being a PAL, I most humbly suggest that the term of venery for the PAL be "cackle," as they're merely scavenging that which is left by the far more luminary UCF. I further suggest that the whole lot of us, UCFers and PALs alike, be christened a flange.